Dr. Richard Deming, founder and chairman of Above + Beyond Cancer, will speak about the small miracles he experiences with patients and survivors every day. Dr. Deming is medical director of Mercy Cancer Center in Des Moines, Iowa. He received a bachelor’s degree at South Dakota State University and his medical degree at Creighton University. Dr. Deming is known in the community for the compassionate care he provides cancer patients and their families. He is involved in many national, state and community organizations and is the recipient of numerous awards. He was awarded the Lane Adams Award by the American Cancer Society for excellence and compassion in patient care. He is the recipient of “the one hundred” Award by Massachusetts General Hospital for his work with cancer survivors. He was awarded the Iowa Cancer Champion Award for his tireless efforts in the field of advocacy. He is dedicated to the principals of human dignity, social justice, and compassion. His greatest ambition is to encourage others to pursue lives of meaning, purpose, passion and compassion. 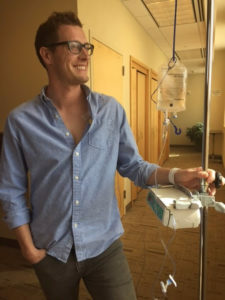 Michael Zimmerman will give a personal narrative about his own journey with cancer. Zimmerman is the Director and founder of RipRoar Events, a Des Moines-based company focused on endurance event creation and production. He also is a nationally recognized sports announcer commentating and inspiring endurance athletes from youth to professional. In 2016, Michael was diagnosed with a rare case of composite lymphoma with both curable and non-curable elements. For the past two years Michael has undergone both aggressive and moderate chemotherapy to stabilize and cure his disease. Michael’s documentation and intentional awareness throughout his cancer journey gives his journey a raw and authentic account. 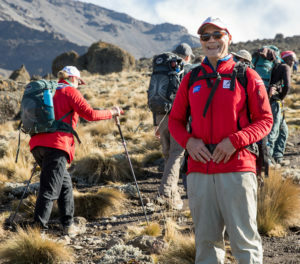 Above + Beyond Cancer takes cancer survivors on incredible adventures, leading participants to places like Mount Everest Base Camp and the top of Mount Kilimanjaro. But their work isn’t about getting to the tops of mountains. Through transformational journeys, participants inspire the public by devoting themselves to a life of advocacy and leading an example for healthy living and cancer prevention in their communities. Please join us for our next “Meet My Religious Neighbor” open house, which will be held on Saturday, February 3rd , from 10 a.m. – 12 p.m., at the Greek Orthodox Church of Saint George. This open house actually is just that! 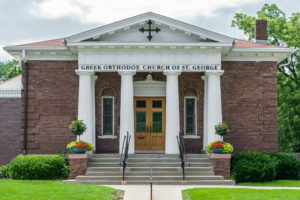 – a two-hour window of time during which to drop in, tour the church, meet the congregation, and learn how they practice Greek Orthodox Christianity. Come to the fellowship hall to sample refreshments and music from the various cultures of St. George! Also enjoy traditional music in the worship space. Father Basil and other members of the community will be on hand to answer your questions and share the history of St. George as well as their experience of worship.